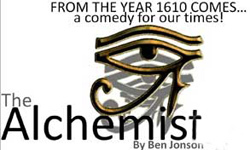 The Alchemist by Ben Jonson opened tonight at the Jericho Arts Centre. It is presented by the Ensemble Theatre Co-operative which is a local group of actors, designers, stage managers and directors. The Ensemble Theatre Co-operative believes that great dramatic literature has not lost its relevance in today’s world. The themes of love, lust, avarice and envy for example are threads that run through our human history linking Ben Jonson’s The Alchemist to events taking place today. The cast of The Alchemist acted out these desires tonight with great ability. They sprinkled in humour and farce to sugar coat our less than stellar behaviour. On entering the theatre one was aware of images being cast on the back wall of the set which revolved in a continuous series giving the impression that the show had already begun. The humour in this series of projections put the audience in a light hearted mood while also suggesting that we were in for a bit of fun. A sampling of this humour can be found in the program where it lists the production staff (in order of quantum of bribes)! The talented production staff includes set design Kyla Gardiner, lighting design Michael Methot, sound design Ross Smith, costume design Kenda Ward, stage manager Stephanie Elgersma and associate stage manager Emily Henney. The appearance of the first three characters in the production got the play off to a rollicking start. Face (Tariq Leslie), Subtle (Trevor Devall) and Dol Common (Joey Bothwell) embraced their roles with gusto. It was evident that these actors had worked hard to develop the characters they were portraying. The mannerisms of each of these characters were very entertaining to watch and also added authenticity to the situation. The audience was engaged because the characters were so entertaining and the actors seemed to be really enjoying themselves. New characters were introduced to the audience as the story unfolded and the complications of the scams being foisted on these unsuspecting victims added to the farce. Dapper (William Hopkins), Drugger (Aaron Turner), Sir Epicure Mammon (Matthew Bissett), Surly (Troy Anthony Young), Ananais (Rebecca Walters), Tribulation Wholesome (James Gill), Kastril (Joshua Simpson), Dame Pliant (Farrah Avira), Lovewit (Glenn Beck) and a Neighbour (Paul Ferancik) exhibited good timing and delivered their lines well. It is an ambitious play to put on because it requires skilful delivery of difficult dialogue and a sense of timing. The seasoned cast were up to the challenge. It is also a difficult play for the audience to follow because of the fast dialogue and the many characters involved in the story. It requires the complete attention of the audience in order to catch the nuances of wit and historical reference that are delivered in this fast-paced play. Tariq Leslie directs the cast and production staff in this ambitious offering. We may no longer believe in alchemy, but we still desire what the alchemists were seeking: wealth, rejuvenation and an elixir of life. In this, the Ensemble Theatre Co-operative saw the relevance to our society today. .